It’s every horse owner’s worst nightmare: Your horse has gotten away from you—either by pulling away while you were leading him or unseating you while you were riding—and has taken off with no indication of returning any time soon. Here are some steps to follow for the best chance of recovering your horse. First and foremost, whether you are at a show or on a trail, if your horse has gotten loose, don’t chase him—this will most likely make him in more of a hurry to get away from you. If you happen to have been riding with others, form a group in an attempt to activate your horse’s herd instincts and make him return to the group. Ask one rider with a calm horse to dismount and walk toward your horse, if he is still within sight. If you have grain with you, shake it. If you have a mint, rattle the wrapper. Do anything you can to get your horse’s attention without making him flee. If your horse has truly left the area, it’s vitally important that you call 911 if he’s near any busy roads. Explain to the dispatcher, who may not be familiar with horses, how dangerous the situation will become (for both the horse and the driver) if your horse gets onto the roadway and is struck by a car. Horses are quite accurate in their homing devices. If your horse has gotten loose while being ridden, walk to the barn or trailer to see if he has returned and is waiting for you. If your horse has escaped from his field, call local neighbors, especially those with horses, to see if your Houdini has wandered onto a nearby farm to make some equine friends. While you will most likely not be able to track your horse by his hoofprints, you might get lucky if it has recently rained or snowed. You will be even more likely to trail him if he is wearing distinctive shoes. Loose horses typically head toward open fields, rarely going into heavily vegetated areas (unless they are seeking water). They also tend to travel uphill and follow a path. While you’ll want to scour the entire area as much as possible, these are good hints to keep in mind when you begin your search. If you still have no idea where your beast has gone, it’s time to enlist additional help. Call the police and file a report. Call the sheriff’s department and file a report with them, as well, as they don’t tend to cover the same areas. If you were trail riding in a park, call the park rangers or management and let them know the last direction you saw your steed heading. If the city in which you are riding has an animal control department, be sure to call them and let them know your horse has gone missing. You can provide them with your name and number, as well as some additional identifying information about your horse, so that you’ll be notified if they are alerted that he has been seen or has been turned in. Once all authorities have been notified, you don’t need to sit on your hands and wait for them to find your horse. You can gather a group of friends or contact a local search-and-rescue group to see if they can assist you. If you lost your horse while riding, have a friend who is still mounted walk the trails and see how their steed reacts—he may see or hear your horse long before you ever would. If it has been more than a day since your horse has gone missing, it’s worthwhile to have posters made with clear shots (both side and front view) of your horse and your contact information; if he’s microchipped or tattooed, have these numbers readily available, and highlight any unusual markings that may make him easily identified. Be sure to post these beyond the local tack and feed stores; any local business that will allow you to post near where your horse was lost can be worthwhile. Contacting local media is a good way to get the world out to residents in the area. Also, don’t underestimate the power or social media; set up a Facebook page and alert lost equine groups, as their reach may be much greater than your personal page. Also contact organizations like Stolen Horse International and the Missing Pet Network, as well as local lost and missing pet pages. If you lost your horse in a park where other trail groups utilize the same space, seek them out and ask them to keep their eyes peeled for your horse. Send an email to the organization’s president or secretary about your lost horse and inquire if they will disseminate it to all of their members. 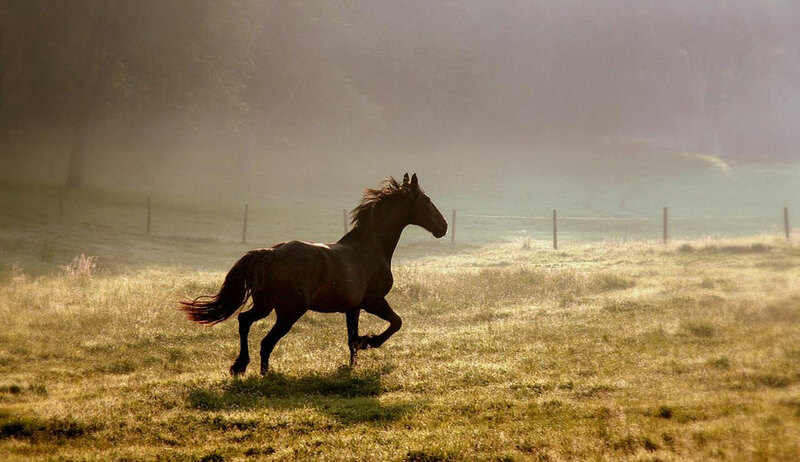 While most horses are found within 24 hours, there is not a more helpless feeling than watching your horse run away. Give yourself the best chance to recover your horse by alerting authorities immediately of his disappearance and doing your due diligence to get him home. Great article!! This is a very scary thought as I often ride alone! Every time I think about my loose horse story, I have to laugh….you’d have to know my gelding to understand that. While riding on a trail, not far from home, I emergently dismounted my gelding cz his evolved into a gallop going up hill. I knew I couldn’t keep seated. He kept galloping leaving me behind. He was gone for some time,(he may have gotten almost back to the barn) until he must have realized he lost me. Then from a distance that sounded quite far away, I was pretty sure I heard him neighing…a short time later, I knew I definitely heard hoof beats.the hoof beats were getting louder, next thing I knew there he was thundering around the bend at the top of the hill from where he lost me. When he saw me, he stopped and called out again, then down the hill he came, right back to get me. The expression on his face was priceless!